Now in its 15th year, this two-day symposium has been planned for the providers who care for patients with rheumatic disease. Given the wide variety of rheumatologic disorders, and an ever-increasing number of diagnostic procedures and treatment options, it is necessary to provide clinicians with information about strategies for the early diagnosis of these conditions, novel state-of-the-art diagnostic tools, and opportunities to utilize the most effective treatments to ensure optimal patient outcomes. 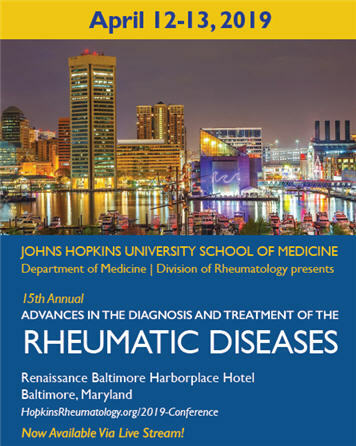 This activity is intended for rheumatologists, internists, gerontologists, orthopedic surgeons, nurses, physician assistants and other allied health professionals involved in the care of patients with rheumatic diseases. A $50 late fee applies to registrations received after 5:00 p.m. ET on April 6, 2019. A handling fee of $50 will be deducted for cancellation. An additional fee may apply for cancellation of other events, including workshops and social activities. Refund requests must be received by fax or mail by April 6, 2019. No refunds will be made thereafter. Transfer of registration to another Johns Hopkins activity in lieu of cancellation is not possible. The Johns Hopkins University School of Medicine designates this live activity for a maximum of 16.75 AMA PRA Category 1 Credits™. Physicians should claim only the credit commensurate with the extent of their participation in the activity. American Nurses Credentialing Center (ANCC) accepts AMA PRA Category 1 Credits™ from organizations accredited by the ACCME. American Association of Nurse Practitioners National Certification Program accepts AMA PRA Category 1 Credits™ from organizations accredited by the ACCME. National Commission on Certification of Physician Assistants (NCCPA): PAs may claim a maximum of 16.75 Category 1 credits for completing this activity. NCCPA accepts AMA PRA Category 1 Credits™ from organizations accredited by ACCME or a recognized state medical society. The Johns Hopkins University has approved this activity for 16.75 contact hours for non-physicians. Successful completion of this CME activity, which includes participation in the evaluation component, enables the participant to earn up to 16.75 MOC points in the American Board of Internal Medicine’s (ABIM) Maintenance of Certification (MOC) program. Participants will earn MOC points equivalent to the amount of CME credits claimed for the activity. It is the CME activity provider’s responsibility to submit participant completion information to ACCME for the purpose of granting ABIM MOC credit.